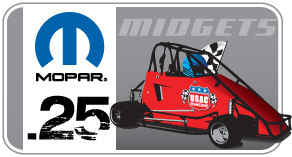 Entries for the inaugural running of the Mopar Speedzone race at the Walt Disney World Resort in Orlando, Fla. featuring the USAC Mopar .25 Midgets are now “open.” Participants can access the entry form for the event at the ESPN Wide World of Sports complex at http://www.usacracing.com/quarter_midgets/mopar_speedzone. USAC has also partnered with Disney Sports Travel to offer discounted participant packages for the inaugural running of the event June 15-20, 2010. The event will feature drivers ranging in age from 5-17 years old. Packages include tickets to the Walt Disney World theme park, transportation services and hotel and campground accommodations. For the participant packages visit: wdw.disney.sports.travel@disneysports.com or call 409-939-7810.